Travel for reunions is big business and getting bigger as families, communities, organizations and affinity groups strive to stay in touch in an increasingly complex post 9/11 world. The U.S. Travel Association estimates that in the last three years, 82 million adults have hit the road to see Uncle Joe play horseshoes with cousin Alice, swap stories with long lost relatives and be part of affinity groups reaching out to each other at annual outings, all generating millions in revenue for the hard-hit travel industry. When Facebook became the monster place to meet and swap stories, the travel reunion business thought they were finished. Turns out the opposite was true, says Edith Wagner, Editor-in-Chief of the Milwaukee-based Reunions Magazine. So no matter how weird we think our families are, they’re still our families, and we’re apparently willing to travel long distances to get together with them. But reunions can go pretty deep. “Many families,” Wagner points out, “memorialize lost family members with candle light services, or they’ll create souvenir booklets and play games like ‘autograph bingo’ as a way for out-of-touch members or the younger generation to get to know each other.” It’s about creating memories, she says. Her advice for families planning that big reunion? • Chose a cruise because they have something for everyone. Cruises and all-inclusive resorts reduce the stress involved in planning meals and activities, creating a worry-free time to get to know each other. • Get creative. Reunion activities can include river rafting, tours of cemeteries in Ireland, East African safaris, Galapagos Islands tours, stays at dude ranches, visiting bike week in Daytona Beach, Fla., or European trips to retrace family heritage. • Use a a travel agent, someone with reunion-planning experience who can handle all the logistics skillfully. • And plan a family reunion around a milestone event like an anniversary or wedding. 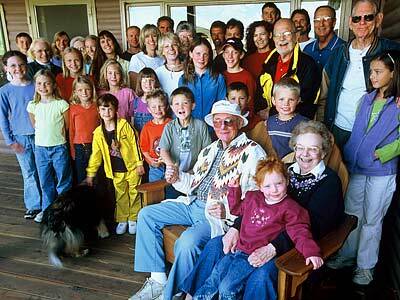 But beware, family reunions can rekindle old animosities and stir up unresolved feelings among family. Dr. Larry Basirico’s funny and wise book, The Family Reunion Survival Guide: How to Avoid Problems With Your Family Without Avoiding Your Family is must-read for anyone planning a reunion, or attending one. It goes a long way toward insuring family feuds stay buried. Been to a reunion lately? How was it? If your readers are interested in a sample of Reunions magazine, go to http://www.reunionsmag.com and click on free copy! Explore the web site while you’re there: hundreds of pages of reunion planning info.